Originally presented as “The HIV Monologues” by Dragonflies Theatre, London in 2017, this production renamed “Pink Orchids” at The Buena, Pride Arts Center is five soliloquies presented by four different actors intertwined to tell one connected story. Barney (Nick Dorado) is producing a semi-autobiographical play about his lover who died of aids. 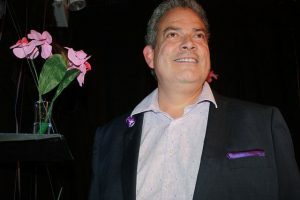 Alex wins the coveted role, assuring Barney that he is sympathetic to the challenges by claiming his support for his own HIV-positive lover, Nick (Don Baiocchi). In reality, at that moment, Nick is merely a passing acquaintance who Alex tried to ditch once he found out about Nick’s positive status. Irene (Kathleen Puls Andrade) is a nurse who cared for Barney’s lover. She gives witness to the story of his humanity, humor, and pathos while in the process of losing his struggle with the dreaded disease. The performance is a bit like a storytelling “slam” a la the “Moth,” where individuals tell well-crafted, entertaining but often heart rending personal tales. Each vignette was skillfully written by Patrick Cash and directed by Brennan T. Jones. Both the writer and director were obviously cognizant of the need to keep this subject matter from becoming too dark. While humorous at times, it is not a joke. Rather, it is a sincere portrayal of a serious fact of life for a considerable number of individuals who contend daily with an inescapable reality. Each character is a distinctive personality type and each actor makes a point of connecting personally with the audience in this very intimate space. The simple set by Evan Frank cleverly consists of a series of hanging shelves with a variety of mementos alluded to during the various sketches including a couple of bags of crisps, a plate of mini-cupcakes, a few photos and a number of potted pink orchids. Produced by Pride Films and Plays, this well-performed presentation is part of the Pride Arts Center Summer Pride Fest. DETAILS: “Pink Orchids” is at The Buena at Pride Arts Center 4147 N. Broadway, Chicago, through July 7. Running time: about 80 minutes with no intermission. For tickets and other information call (866) 811-4111 or (773) 857-0222 or visit Pride Films and Plays.